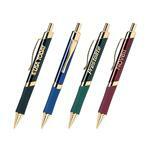 The Imprezza Metallic Pens laser engraved with your custom logo. Metallic colors set off by scultped chrome accents. Spectacular silver engraved imprint matches accents. Comfortable rubber grip and generous imprint area. Black ink cartridge. 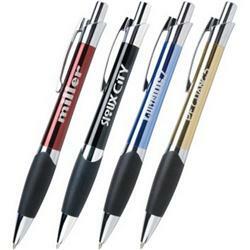 A quality promotional metal pen at a great price. Available Colors: Black, Champagne, Light Blue and Red. Typical Imprint Area(s): 2" x 1/4". Metal Pen, Rubber Grip, Laser Engraved, Black Ink. 6 lbs. per 75 pens.